Adapted from the Druidry Information Pack written by David Smith, Copyright 1997, and information from the Pagan Federation UK website All rights reserved. The Druids were the educated elite of what is now called the "Celtic" race. The Celts were a tribal people, with each tribe having its own chieftain. They were often at war with one another, raiding nearby tribal villages and stealing their neighbors' cattle. They were a warrior race who, in one of those strange historical paradoxes, created the most beautiful art and inspired a religion which had a deep respect for Nature. As the Romans conquered Britain, the Druids retreated to Ynys Mon and became trapped. All of the Druid Groves (sacred clearings within the forests) were destroyed and all Druids, Druidesses and their children were slaughtered. The other blow was the defeat of the Iceni Queen Boudicca whose revolt very nearly put an end to the entire Roman occupation. However, the massacre of the Druids did not destroy the religion. It continued in smaller groups and gradually the Druid was seen as little more than a wandering magician. Druidry means different things to different people. There are those who take their spirituality from Druidry and blend it with their own tradition, be that Pagan or Christian. Druidry stresses the mystery of poetic inspiration and explores healing, divination and sacred mythology. The three grades of Druidry are Bards, Ovates and Druids. The word "grade" conjures up a hierarchy of learning and importance, implying that the Bard is the infant and the Druid the university graduate. However, this is not the case. A better way of considering the grades would be to view them as three parts of the same journey - the Ovate (or Druid) is still a Bard and always will be. The three grades teach very different techniques, which can be seen as a range of skills usable in different situations. The Bardic grade is concerned with the Arts, with giving a voice to the child spirit that lives within us all. It encourages the personal growth of the individual by working with the four elements of Earth, Air, Fire and Water. Experiencing the individual elements, and learning to integrate and weave them into our awareness, we move towards a greater wholeness. Once the work with the elements has begun, the Bardic tradition starts to explore the poet/ storyteller within us all. Bards are encouraged, through ritual and meditation, to get in touch with their creative selves - whether that is painting, poetry, music, raising children, or following a profession. The spiritual work of the Bard is done mainly in the physical world - allowing the individual to further understand how Druidry and the elements interact within the actual world in which we live, before delving into the inner planes. The Ovate works very much with the unseen world, both within and without. The historical Ovates were the tribal Shamans, and this element is still the inspiration behind the work of modem Ovates. During the Ovate work the student can work with both elemental and inner healing; divination using the Ogham (tree alphabet); the wealth of Druid tree lore; the elemental and faerie realm; leylines; and the three realms of past present and future. Druid ritual takes many forms and has many functions. Druids draw on various sources for ritual - including mediaeval and later Celtic literature, previous generations of Druid revivalists, archaeology, poetry, and other traditions. But they draw mainly on their own judgement, and experience, of what is right for a given moment. Ritual may take place anywhere - from great Stone Circles to private rooms. Most take place outdoors, since contact with the Earth, Sea and Sky is very important to the practice of Druidry. Group rituals commonly celebrate the eight major festivals. Rites of Passage include the naming or blessing of children, the onset of puberty, Druid weddings (handfastings), and passing on. Rituals may also be directed towards healing or spiritual growth. 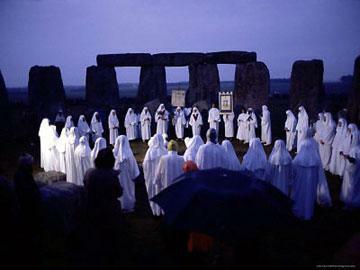 Druid ritual brings the participants into contact with the Spiritual. Thus our lives are touched with the deep sources of inspiration, creativity, wisdom and healing. A discussion of modern Druidry would not be complete without reference to Edward Williams, whose Bardic name was lolo Morganwg. He lived in the 17th century and it is difficult to deny his influence over the direction of what is now termed the "revivalist" period of Druidry. lolo presented the world with several "authentic" documents, which he claimed were the ways of the ancient Druids, in a book called the "Barddas". These gifts included the Circles of Existence. The Barddas is now 200 years old which makes it an ancient document by modern standards. It contains much visionary material, but it is the Three Circles of Existence- Abred, Gwynvid and Ceugant - that we shall explore here. The central space represents the cauldron of Annwn. The three circles represent the journey of the Spirit/Soul. Annwn: All life begins in Annwn. This is the home of the Cauldron of rebirth - the smelting pot of Spirit. Once born the Spirit is within the Circle of Abred (physical). Abred: Abred is the Circle of the physical - of mineral, plant, animal and human. It is the Spirit's journey of enlightenment through the four realms, which is taking place in the world around us. There are many roads we can travel during our lives, and the realm of Abred is our learning ground on the way to oneness with Spirit. If our lives have been lived with an awareness of all existences then the cycle continues; others may slip back into the Cauldron to be reborn again, retaining the lessons learnt. Some may find peace within the shape of animals, or the running Spirit of a river. Gwynvid: Once the physical journey is complete and that oneness with Spirit has been attained the Journey moves into the Circle of Gwynvid. Here we find the Enlightened Ones who have gone before - spirits who have greatly affected the spiritual direction of Abred with their teachings. Ceugant: This is said to be the Circle of the Spirit / Goddess/God alone - the one governing force of the universe and nature which watches over us all. It is the ultimate space of creation from which all came and into which all will return. Some see the Circles as a spiral which takes us on our inward (rather that outward) Journey to the Source. It is however important to state that the three Circles do not form a dogma. The one thing that becomes increasingly obvious to the student of Druidry is that Druids love trees. They are an integral part of the Druidic magical system known as the Ogham (pronounced oh-am). The letters of the Ogham (or tree alphabet) are formed by scratch marks along a horizontal or vertical line. They are linked not only with the wealth of Druid tree lore but also with birds, stones, colours and many other things? Central to Druid philosophy is the force known as the Awen. Literally Awen means "flowing spirit" and it is this flowing spirit that guides us through the Druid work and, because the force of the Awen is described thus, it can be seen as many different things. The symbol of the Awen is the "Three Rays of Light" shining from three single points surrounded by three circles. The three points represent the directions of the sunrises of the Solstices and Equinoxes. On the Summer and Winter Solstices the Sun rises east-north-east and east-south-east respectively, whilst on the Spring and Autumn Equinoxes it rises due east. The Awen also symbolises the three drops of inspiration from the Cauldron of Ceridwen. 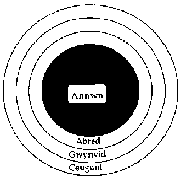 The three circles represent the three Circles of Creation in Welsh cosmology, ie Abred, Gwynvid and Ceugant. The central blackness represents the realm of Annwn. 1.Do you have to be Welsh, Cornish, Breton, Scottish or Irish to follow the Druid tradition? "No. All though the Path takes its inspiration from the "Celtic" countries, the spirituality and philosophy taught by Druidry is not constrained by your ancestry or where you live." 2. Did the Druids build Stonehenge? "Some historians now say that the 'Celtic race' never reached the British Isles in any great number. The British were British until the invasion of the Romans and, later, the Saxons. If Caesar's statement that the Druids from Gaul were sent to Britain to be trained, then Ancient Druidry already existed on this island. These ancient people have been called "proto-Druids". If this is true, then Stonehenge was built by Druids, long before the religion reached its height during the iron age. However, other historians dispute this. So, the answer is... maybe..."
3. Do I have to wear a white robe? "No. Many people feel uncomfortable wearing robes. Others will wear a robe linked with the colour associated with their grade, for example: Blue for Bards, Green for Ovates and white for Druids." 4.Do I have to be able to write poetry, tell stories and play an instrument? "It is not necessary to have any artistic talents to begin to tread the Druid Path. These are things that can be learnt along the way as the Awen inspires you." 5. Do Druids worship the Sun and always perform their rituals during the day? "There are no fixed rules as to when Druids perform their ceremonies; however, the public rituals are often held "in the eye of the Sun". 6. Is Druidry patriarchal? "The 18th century revivalists were mainly men so Druidry did get the reputation of being a patriarchal tradition. These early revivalist Druid groups bore more similarity to freemasonry than to historic Druidism. In recent years membership of many Druid orders is divided equally between men and women." 7. Do Druids meet in groups? "When Druids meet in groups they are called "Groves". Some Orders also have Seed Groups, made up of people who are just starting their Druidic Journeys." 8. Do Druids have to honour the Celtic Gods? "Although Druidry draws its inspiration from the Celtic religion of Druidism, people are free to find their own Path to their Deity or Deities. Personal freedom is paramount in most modern Druid groups."